Temperature: 235-255F (115-125C) Certification: CE Transfer Products: Item to be imaged ie: candle, glass etc. 2. Use Laser Printer with original inks only. - Item to be imaged ie: candle, glass etc. - Copy/Print in Plain Paper/ standard Mode. - Trim imaged WT as close as possible to image without cutting into image, using scissors / exacto knife. - Fill suitable size bowl with warm water and add about 5%-10% liquid dish soap to bowl of water. - Wet the item to be imaged in the bowl of water and set to one side. - Place imaged WT in bowl of soapy water for 5-10 seconds. - Put wet WT on plastic, image face down, and cover with plain sheet of paper to take off excess water. - Gently remove paper backing from WT Transfer Paper. 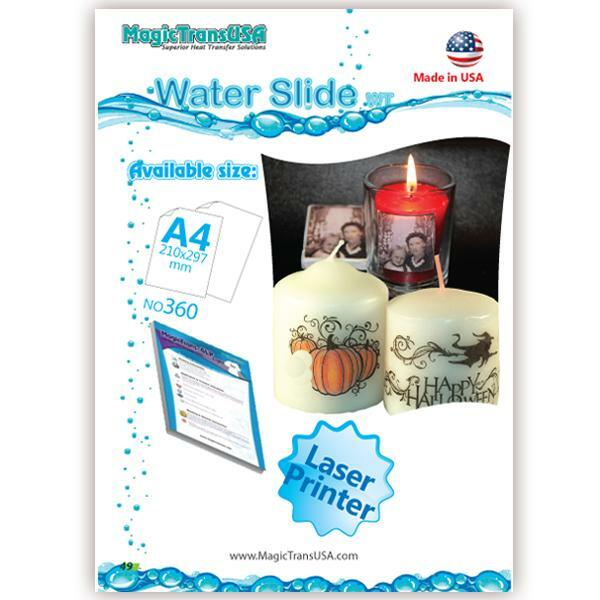 - Pick up plastic with image decal / film laying on top and place on candle, glass or other item. - With sponge or finger correct position of decal and take out any air bubles. - Let dry for at least 1 hour before handling.